Do you count your blessings? I must confess that I'm usually too busy to spend much time thinking about mine, let alone trying to marshall them all into an orderly numbered list. And I've been super busy this past week. I've had my family to stay and lots of good friends to catch up with, who don't have any language in common with the aforementioned family, which has led to a lot of simultaneous translating. I've had work to do, deadlines to meet and the most wonderful sunny afternoons that I've not always been able to make the most of. But, just for Nancy and Random 5, here are five of the things that I've been truly grateful for. Mr B and Emi have become dedicated tennis players. Every morning of the holidays they've made their way to the tennis club for some lessons with the Pro, which has kept them firmly out of my orbit leaving me to get on with the other cast of characters who can't understand one another. The tennis over here is amazing: all clay courts and coaches who claim they're good chums with Rafa Nadal. They keep pestering me to come and knock a few balls around with them. Maybe next week when Mr B is working and I have to take Emi to his classes ... .
We always have a lovely time catching up with everyone when we come out here. Emi has the very best time with his cousins. He says they rock, and they do. And so do their parents. We've got a big family get-together at a wonderful beach restaurant tomorrow. 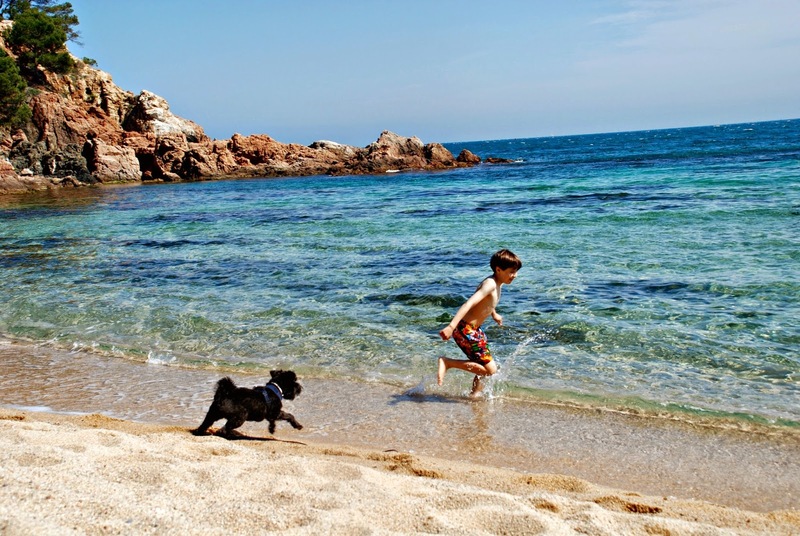 It's nothing fancy, but it's on the most divine sandy beach where dogs and children can run around until they're exhausted leaving the adults to enjoy a chat on the terrace. During our time here we eat as much seafood as we can manage. 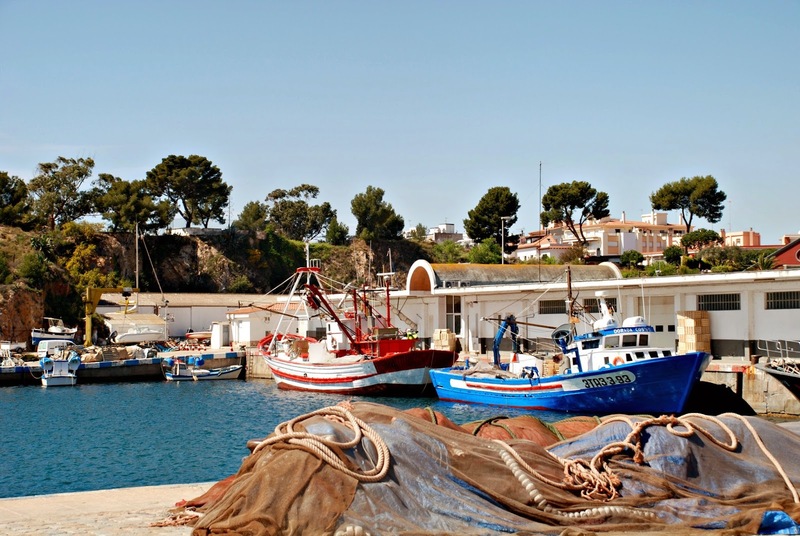 Our village, St. Feliu de Guíxols, is a traditional Catalan fishing village. We hear the heavy diesel engines pulling out to sea every night as the fleet goes fishing. And next day the market is a positive joy. Emi is eating his fill of navajos (razor clams), mejillónes, (mussels), gambas (prawns) and calamari, (squid). My dear friend Marian brought me a lovely bunch of wild asparagus earlier in the week. I was struck by the novelty of her gift: I've never had wild asparagus before, but it grows here in sandy shaded spots close to the forest. After much debate we decided to use them to make a tortilla. And very good it was too. 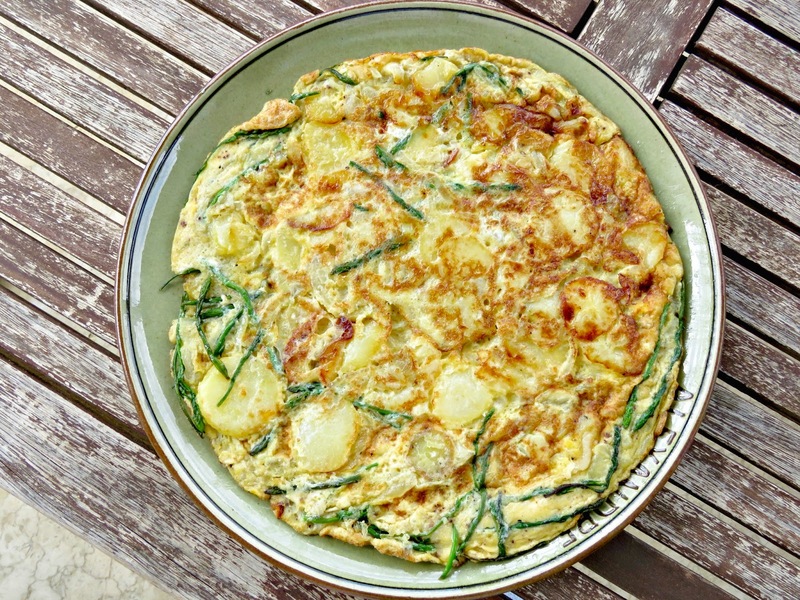 You can read the recipe here: Wild asparagus tortilla. We spend a lot of time on our walks foraging for pine cones, which are wonderful for lighting the fire on those colder evenings. They smell wonderful too. And later today I've got a grand plan to wander off along the cliff tops in search of some wild garlic. I'd like to gather some to infuse with a nice bottle of white wine vinegar and another special bottle of extra virgin olive oil for my salad dressings. I'll let you know how I get on. I firmly believe that in any corner of the earth, if you look around carefully, you can find somewhere unique and special and marvellous to visit. We've been very spoilt during our recent road trip through France; we saw so many fabulous places, and I've finally managed to do a post about the Royal Abbey of Fontevraud, where the Plantagenet Kings were buried, and where the Sisters were the folk in charge. It must have been an amazing community of educated and well-connected ladies, who blazed their own trail through the Middle Ages, calling the shots and leaving gender inequality firmly outside at the gates of their convent. 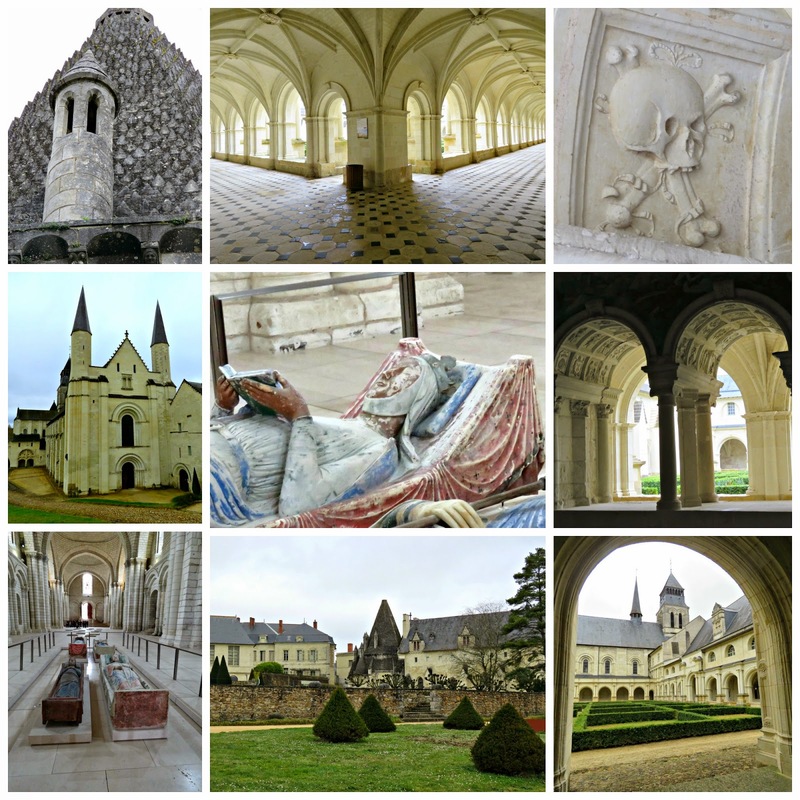 If you'd like to find out more you can read my post here: Fontevraud: where medieval women called the shots. 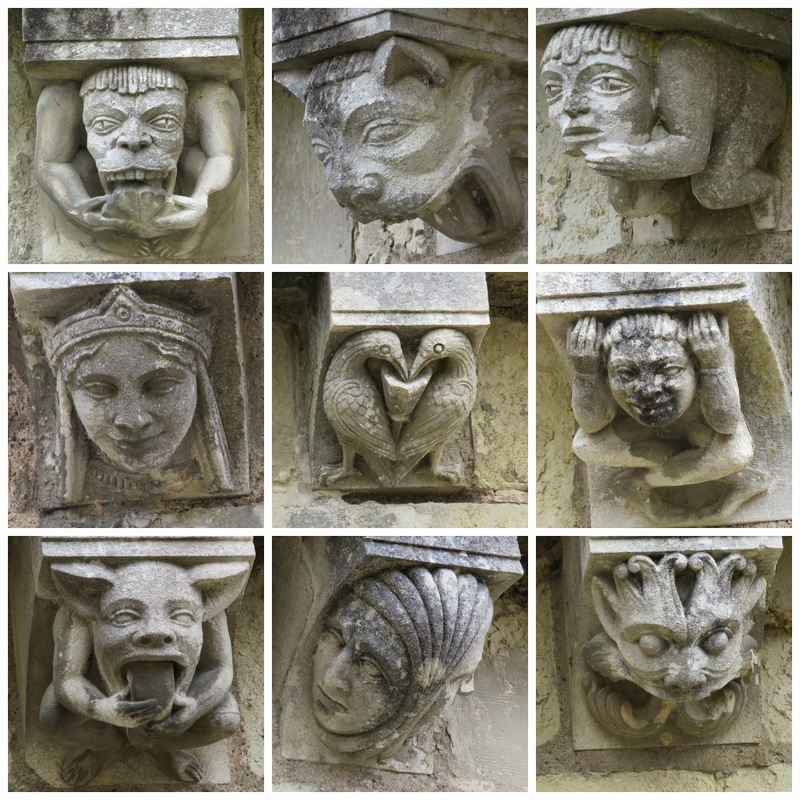 And they've got the best gargoyles ever hanging from the eaves of the Roman kitchens. Because everything's been a bit crazy so far I've promised myself a weekend of soaking up the sun and taking life really easy. I'm trying to finish Victus, the fall of Barcelona by Albert Sanchez Pinol. It's set in the War of the Spanish Succession, and tells the story from the perspective of a siege engineer. Mr B and two of my brothers-in-law raved about it, but I'm not enjoying it quite so much as they did. My interests are more those of a social historian; I find the history of conflict soul-destroying. At the same time we're going to be listening to my late father-in-law's vinyl collection. Papa Juan was a serious music buff who loved opera and classical music. When he passed away last year Mr B got a share of his huge record collection. 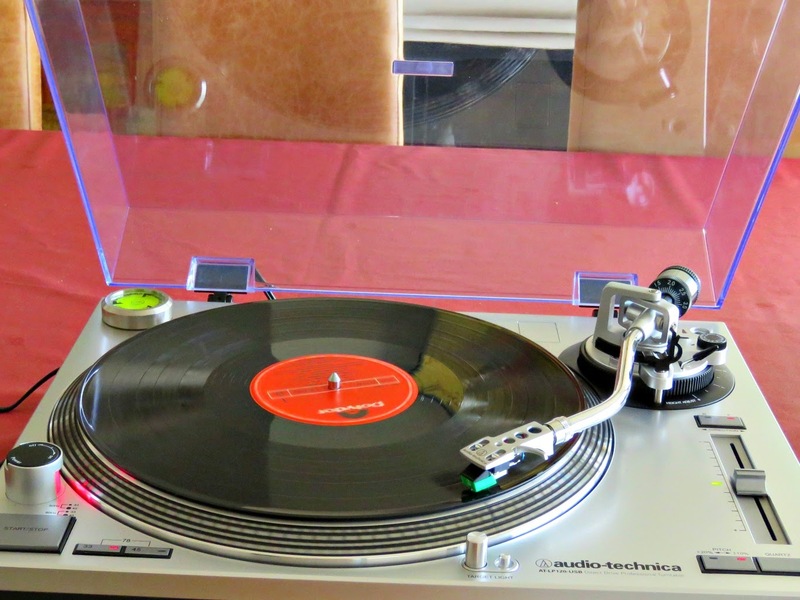 He's been fiddling around this morning, and finally managed to get a turn-table wired up to the speaker system, so we're all set to enjoy some good music. For someone who's used to logging on to Spotify it seems like a lot of trouble to go to, but still it will be nice to listen to the old records and to feel just a little bit closer to a much loved abuelo, who is sorely missed. Whatever you're doing this weekend: have a good one! Looks like a great place to explore. Ah old vinyl what a delight. What a beautiful place! I am drooling over the beach with the blue water. :) I have never had 'wild' asparagus. Is it better that regular asparagus? Love all the gargoyles. Music has gotten easier to listen to... but when I hear crackles in music from a record player it brings about a reminiscent feeling... Enjoy your weekend! Lovely post. You have much to be thankful for .. traveling, family. Love the gargoyles and the wild asparagus. I bet it was good. Enjoy!! !